Ask fellow campers about "Fireside Campground" and nearby attractions. I think it was a seasonal campground until the new owners took over. 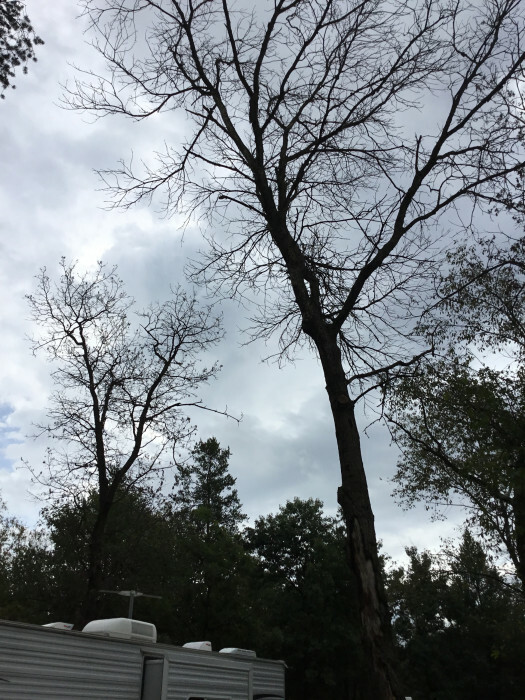 They do need to trim dead trees that could be an issue with a storm. Our site was a good size and we were able to put a large screen house on it. Owners (woman) let seasonal campers do whatever they want, not following rules. DOGS OFF LEASHES! No pool. Pretty boring. I didn't find anything special about this campground. 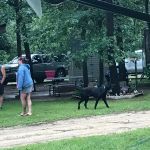 We camped at Fireside Campground in a Travel Trailer. We camped at Fireside to be more in the "woods" and real camping. The grounds are quiet, and the sites were spacious, although ours was a bit sandy. All was functional at our full hookup site. The owners are very helpful and friendly, in fact were so kind as to mail us back our water pressure regulator after we forgot it on the spigot when we left. The playground area kept the grand kids busy and they have some kids activities on the weekend. We camped at Fireside Campground in a Fifth Wheel. House on the Rock and Taliesin are near by. 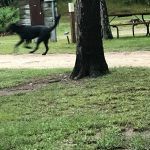 We spent a day at Gov Dodge State Park. Stephens Falls is worth the short hike. Close to the attractions of Spring Green, Gov Dodge State park (wow) and even the Dells for a bit of a drive. Owners have been making great improvements at the camp ground. 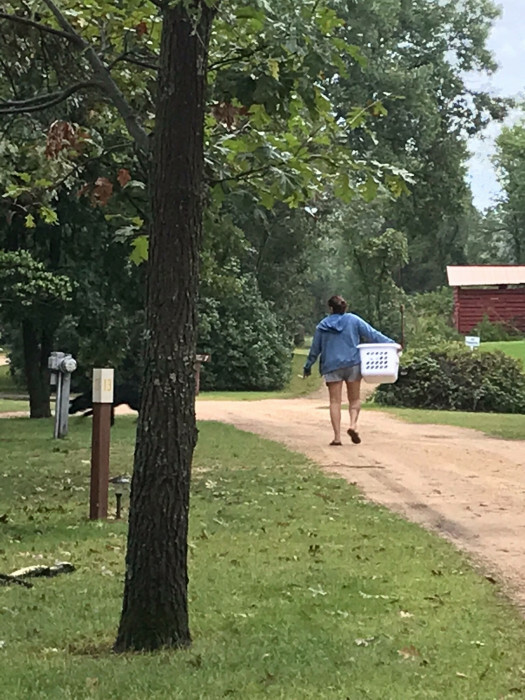 They lead you to your site and deliver the firewood to you. We camped at Fireside Campground in a Travel Trailer. Slightly rustic feel in a good way at this campground. We had a newer pull through site with full hookup, level and really enjoyed our stay for 3 nights. Lots of paths for walking/running. WiFi was poor every day. We camped at Fireside Campground in a Travel Trailer. Arcadia Bookstore/Kitchen in Spring Green is a great place for lunch or a coffee/tea. WiFi is fast, cozy atmosphere and very nice book selection. 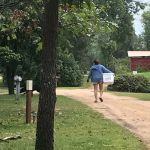 Cedar Grove Cheese in Plain, Wisconsin gives a cheese tour from observation windows and offers samples. The drive to Plain is through very picturesque countryside. We had booked the cabin that allowed dogs, but our reservation was messed up, so the proprietor put us in his travel trailer. Friendly, attentive service. Clean and well maintained park with lots to do. We enjoyed the free mini golf. WIFI was sketchy and so were our AT&T phones. We camped at Fireside Campground in a Travel Trailer. Surprised there are no reviews here since 2014, happy to provide update. Their web site indicates the current owners took over this place in 2011, and are slowly converting it from seasonal-only to a mix of seasonal and transient travelers like ourselves. They recently added about 6 new 50A, full hook-up pull through sites, and we used one of them. The interior roads and sites are all packed gravel. The sites are not exactly level, so some adjustments to wheels needed. Also, there are a number of spots on roads and in the new S1-S6 sites with low or very close tree branches that should be trimmed for bigger rigs. Owner that accompanied us to our site did a little trimming as we pulled in and set up. Owners are friendly and helpful. There is no Verizon here, but their WiFi is useable, perhaps with weak signal in some areas. We got some decent TV and radio reception just using antenna here. Their bathrooms and showers are average and clean enough. Although we did not use it, the laundry facility looked like newer equipment and clean. Also, this was one of few campgrounds we had on long trip that actually encouraged and provided containers for recycling, a plus. One drawback: mosquitoes here were awful! Time of year I guess, be prepared. In these days of decreasing CG availability, nice to see a prior seasonal-only CG converted to welcome travelers. Hopefully they continue to progress on their upgrades. Thought it was a bit pricey however. We camped at Fireside Campground in a Fifth Wheel. Frank Lloyd Wright's Taliesin site in Spring Green, of course. The tourist-trap "House on The Rock" had us skeptical at first (Part 1), but were enjoying the uniqueness of it in parts 2 and 3, so do the whole tour. Cheese fans should visit Carr Valley Cheese shop in Mazomanie. Devil's Lake State Park is also pretty scenic, with some awesome steep rocky hikes to bluffs and views, but be aware it gets utterly packed on weekends. 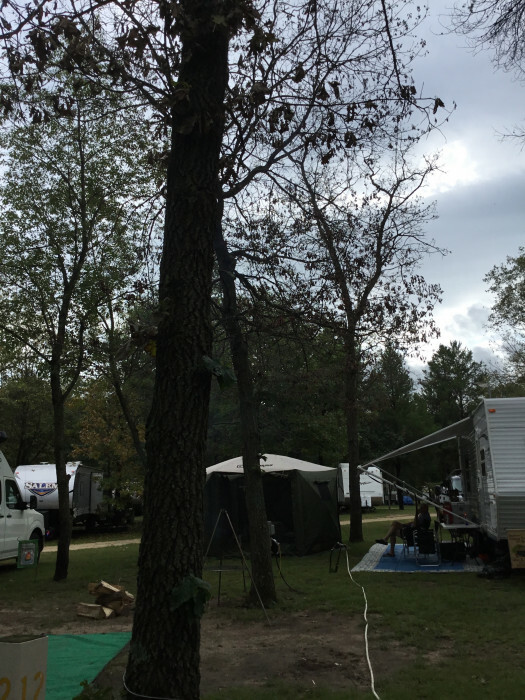 Campground has been upgraded and owners continue to work on improvements. There are many newly graveled sites with full hook-ups (including sewer) and 50 amp. We stayed in one such site. We had to use some boards to level our motorhome, but it wasn't too bad. Site was wooded but wide enough to put out 4 slides & awning with no issues. Trees also provided privacy. Nice firepit and table at the site. The laundry was great - not new but clean and functioning. Camp store is well-stocked. They deliver firewood to site. Great playground and lots of outdoor games for kids and adults. Spring Green area has little to no AT&T or Verizon. We camped at Fireside Campground in a Motorhome. It's about 20 minutes to Taliesin and 25 minutes to House on the Rock. If you are looking for a quiet, secluded place in a rustic setting this is where you want to head. However, be aware and prepared for the lack of sewer hook-ups, especially if doing more than an overnight. We stayed 5 nights and had a spacious, long pull-through site in a wooded area that required absolutely NO leveling. That said, there were several negatives we found during our Monday-Friday stay. First, having no sewer connections required us to use the facilities in the bathhouse but the bathrooms were not cleaned until the last day of our stay. We are well-versed RVers and consider ourselves to be easy-going but we found this to be unacceptable. Also, there was no hot water in the sinks in the bathrooms. In addition, there was never anyone in the office to address questions, buy ice, or provide help if needed. 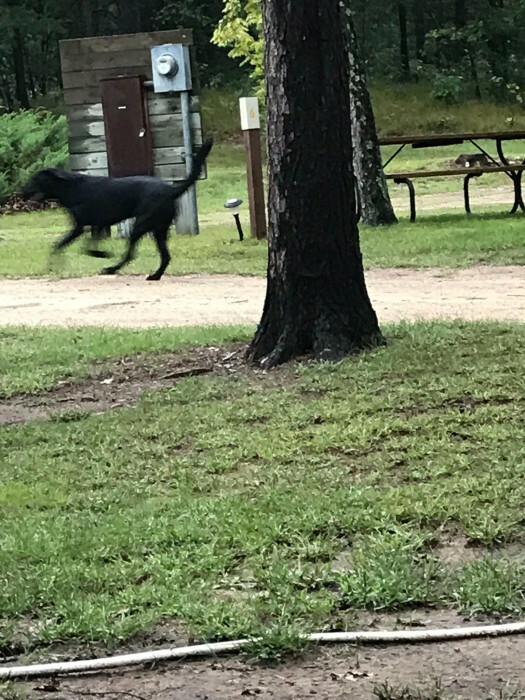 The owner of the campground was friendly and tried to be helpful but appeared to be busy with a personal project rather than taking care of business. 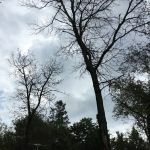 We were disturbed to find we had no cell service, no emergency phone provided and we could rarely find anyone around leaving us concerned should we have an emergency or health issue. On the other hand, the Wi-Fi reception was excellent. The $30 rate seemed high for a campground with no amenities or services. 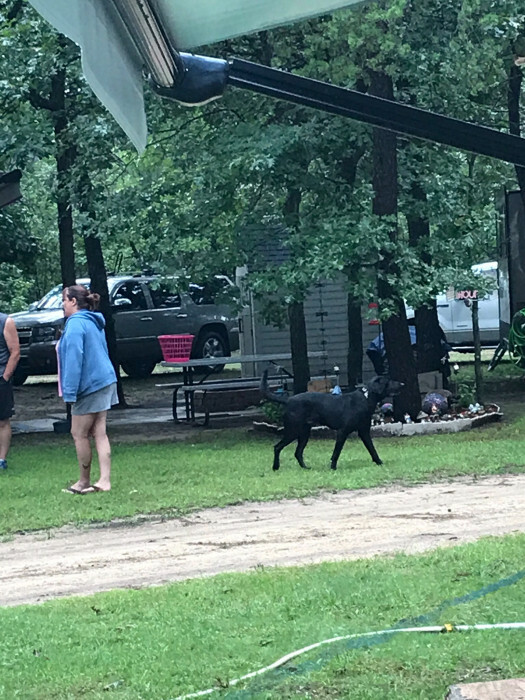 We understand that the owners have only had this campground for 2-3 years but feel that they need to do more to upgrade it. We used it as a home base to tour Taliesen and The House on the Rock. Both are quite a distance from the campground and we suggest looking for another place to stay closer to Spring Green while seeing these tourist attractions. We camped at Fireside Campground in a Fifth Wheel. Some pull-through sites, but they are all dirt. Passport America rate one night, but not on weekends. Electric and water only. It's 10 miles west of Spring Hill and about 16 from House on the Rock. Too expensive for what you get. We camped at Fireside Campground in a Motorhome. 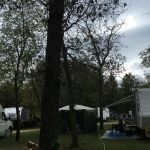 Large, shaded, peaceful campground with a "homey" feel and friendly hosts. Older facilities, but restrooms/showers were very clean. Sites are mostly grass but level and well spaced. The owners appear to be upgrading as evidenced by the new, large playground. Peaceful. WiFi was good, but AT&T service was very spotty. We would stay here again. We camped at Fireside Campground in a Motorhome. This campground was recently purchased by the current owners. They have invested in upgrading every part of the park. There is new electrical service including 50 amps at many sites. Lots of shady sites. Bathrooms & showers are brand new and very, very clean! The sites are level, & there are many different size sites. They offer group sites for both tents & RVs. Owners are very friendly! We camped at Fireside Campground in a Motorhome. Are you affiliated with Fireside Campground ?